will be over time, and the more likely it is to continue. How will the results of this study tangibly impact NOAA? As a descriptive study, this is valuable to NOAA in- formationally. 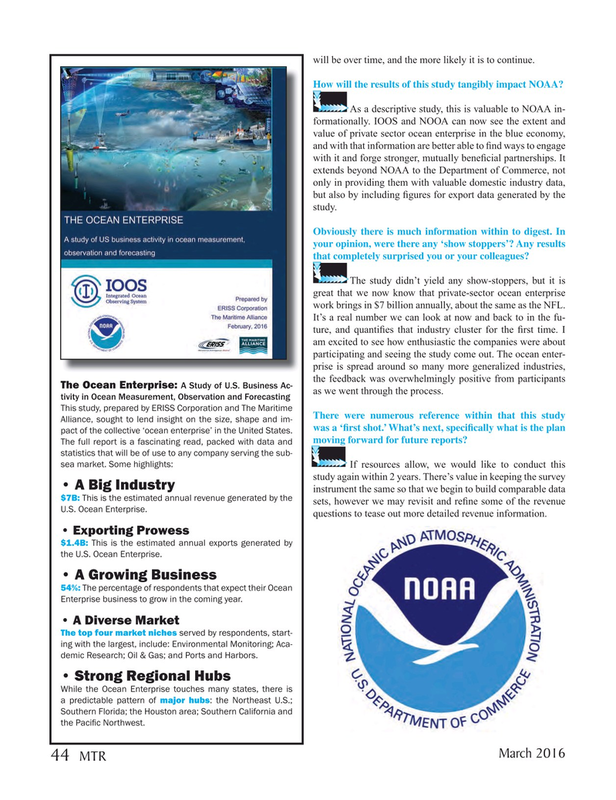 IOOS and NOOA can now see the extent and value of private sector ocean enterprise in the blue economy, and with that information are better able to ? nd ways to engage with it and forge stronger, mutually bene? cial partnerships. It extends beyond NOAA to the Department of Commerce, not only in providing them with valuable domestic industry data, but also by including ? gures for export data generated by the study. Obviously there is much information within to digest. In your opinion, were there any ‘show stoppers’? Any results that completely surprised you or your colleagues? The study didn’t yield any show-stoppers, but it is great that we now know that private-sector ocean enterprise work brings in $7 billion annually, about the same as the NFL. The Ocean Enterprise: A Study of U.S. Business Ac- as we went through the process. Alliance, sought to lend insight on the size, shape and im- was a ‘? rst shot.’ What’s next, speci? cally what is the plan pact of the collective ‘ocean enterprise’ in the United States. moving forward for future reports? questions to tease out more detailed revenue information. • Exporting Prowess $1.4B: This is the estimated annual exports generated by the U.S. Ocean Enterprise. Enterprise business to grow in the coming year. The top four market niches served by respondents, start- ing with the largest, include: Environmental Monitoring; Aca- demic Research; Oil & Gas; and Ports and Harbors. Southern Florida; the Houston area; Southern California and the Paci? c Northwest.